I�ll tell you right up front that I�m not a fan of the New York Yankees. I�m actually a die-hard Oakland A�s fan, and with New York's theft of Reggie Jackson and the phantom out called when Derek Jeter threw home to nab Jeremy Giambi during a playoff game earlier this decade, I have some pretty specific reasons for disliking them. Still, there�s absolutely no arguing with their rich history and tradition, unparalleled in all of sports. Now, with the last baseball games being played in legendary Yankee Stadium this weekend, A&E Home Video allows us to easily revisit some of the most memorable games in its history thanks to their release of The New York Yankees: Essential Games of Yankee Stadium. Sure, it�s great to revisit these six games in their entirety, but it�s even better to take another look at just how far sports broadcasting has come, given the 26-year span from the oldest game to the newest. The first disc houses Game 5 of the 1976 ALCS with the Yankees hosting the Kansas City Royals. With games now on Fox, ESPN, TBS, and countless other networks, it�s easy to forget that over 30 years ago, ABC was the only network we could turn to for live baseball action. This game is a wonderful start to this set, the rare teaming of Howard Cosell and Keith Jackson a major reason to tune in, even if you�d rather stick with the more recent fare on the higher-numbered discs. The final two innings are an example of classic baseball drama, with an ending that�s tough to beat. Disc 2 is Game 6 of the 1977 World Series between the Yankees and the L.A. Dodgers. This is basically the Reggie Jackson show as he belted three home runs in his first three at bats, then has to physically fend off the fans that rush the field at the end. We get the same announcers, plus Tom Seaver, but the play-by-play isn�t as entertaining as in the game on Disc 1. The third disc has Game 2 of the ALDS between the Yanks and the Seattle Mariners, with its big draw being that it was Don Mattingly�s final game at Yankee Stadium. Of course any 15 inning playoff game is bound to be full of thrills and excitement, and this contest definitely doesn�t disappoint. Next is Disc 4 and a look at Game 6 of the 1996 World Series against the perennial post-season runner-up Atlanta Braves. These guys seemingly made it to at least the NLCS every year for over 10 years, but could only make it over the hump once in that time span. The Yankees were trying to ensure a second-place finish for the Braves here, and got a tough battle in the process. Disc 5 brings us to Game 4 of the 2001 World Series against the upstart Arizona Diamondbacks. This game was played just over a month after the 9/11 attacks, so the Yankees (and D-Backs for that matter) were playing with plenty of emotion in their efforts to even the series at two games apiece. It turned out to be a great extra inning affair with the Yankees� fate resting on Derek Jeter�s usually-capable shoulders. The sixth and final disc contains a classic game in the storied rivalry between the Yankees and Boston Red Sox. It doesn�t get much better than Game 7 of the 2003 ALCS, with the Yankees overcoming an early deficit and battling back to take things to a climactic 11th inning. Even though we got some amazing heroics from Aaron Boone, it�s worth noting that this was basically the last time the Curse of the Bambino reared its ugly head for the Red Sox. 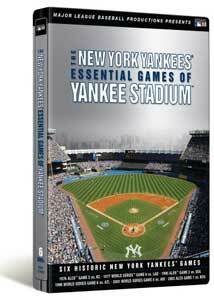 While this isn�t exactly a complete history of Yankee Stadium, it�s still a fine job by A&E Home Video, compiling what are arguably the best games played there in the last 32 years. Image Transfer Review: All six games are presented in full frame aspect ratios, and the overall quality of each varies. Naturally, the newer games feature better image detail and brighter, more vivid colors, but the games from the 1970s still look pretty good, despite an overabundance of grain and faded hues. Audio Transfer Review: The same goes for the Dolby Digital 2.0 audio, which also varies from game to game. The newer games feature more dynamic mixes, with some nice channel separation, but the play-by-play is always crisp and clear for all of the games. Extras Review: There are some bonus features on the sixth disc of the set, in the form of highlights and interview footage involving other memorable moments in Yankee Stadium history. We see a wide variety of content, ranging from Chris Chambliss� huge home run in Game 5 of the 1976 ALCS to another look at �The Dive� by a bloodied Derek Jeter on July 1, 2004 against the Red Sox. Whether you love or hate (there�s really no in-between) the New York Yankees, it�s truly sad that Yankee Stadium is on the verge of going dark for good. A&E Home Video has come through with a great way to remember the old ballpark with The New York Yankees: Essential Games of Yankee Stadium.